Mathematicians: if you have this in your opening 7, what's the chance you have Bazaar by turn 1? What if you have 2, 3 or 4 of this beauty in your hand? This has other applications too, right? I mean, it is playable in Oath as an eventual starting bonus, but as a castable utility creature. 4/4 flyer for 4 is not laughable either (trades with every Shops and Eldrazi creature outside Wurmcoil and Smasher). Interesting, but I'd be concerned with the unreliability of keeping this in your opener and hoping that you can scry to Bazaar. Your percentage on a random 7 + on the draw would go from 44.5% to 56.5% with this card in that random 7. @vaughnbros I'd like to see comparisons in % of just taking out 4 Powder and putting in 4 of these. It's not an easy task though, since having 2 of these in your hand highly increases your chances of finding Bazaar, but mulliganing into one makes it worse than Powder, I guess. I often ascribe a very high value to pregame effects as they cannot currently be interacted with at all. I think putting this into pitch dredge is potentially very strong. Once you have mulled down to 3 or less (maybe 4 or less) I believe that keeping a hand with one of these is a better option than to continue to mulligan, and even in hands with Bazaar this is not a dead card as you can dig much closer to your 2nd bazaar without removing relevant pieces from your deck like a serum powder can do. Also, Scry 3 has got to be worth a cards worth of value if not more right? I think there may be any number of traditional blue decks that just run this without ever intending to cast it, realizing that once they get the effect that can go ahead and Scry/brainstorm/jace/force pitch other copies. I could literally see a pregame effect like this being restrictable level strong. You are getting a cards worth of value for free without the loss of the card that does it. Even leyline of the void has the "cost" of becoming vulnerable on the field. I think this may be a lamentable printing. @protoaddct Do you think controlish blue decks (probably with JVP and Dack) would want to play 4 of these? Maybe, right? Having more than 1 in hand is great too since you can actually dig 7 cards down. Maybe it's actually good in combo, to sculpt the first 2-3 turns. @fsecco I think the trouble with using this in Dredge is that you don't know whether you've found Bazaar or not. Dredge nearly always ends up with Bazaar in its opening hand via hyperaggressive mulligans (according to this it actually has around a 95% chance of finding it, assuming 4x Serum Powder and willingness to mull to one). I don't think I've played a game against Dredge where they've failed to play a Bazaar on their first turn. For a deck that's so reliant on starting with a specific card, I don't know how you keep a hand that just has a free scry 3 in it and hope for the best. @fsecco Unsure. This cards have a lot of interaction and tension with each other. They interact with shuffle effects both greatly and extremely poorly. Your deck wants fetches to interact with the top, as well as jace and brainstorm to get rid of the card after you milked the effect from it, however the more shuffles you have the more you risk hand where you cannot safely crack your fetch without removing the value of the card. It'll be interesting to see how this pans out for sure. @craw_advantage In Dredge I would not think of this card as Serum powder 5-8 at all, but just a supplement to help you get to Bazaar 2. On a hand of 7,6,5, or 4 I suspect you are always going to mulligan or powder a hand without Bazaar. Once you get to the lower numbers however this card does start looking better. I have had plenty of mulligans where I went down to 3 in dredge when I used to play it, and if this was one of the cards in my hand at that point I can easily imagine keeping that hand because scry 3 will dig you further into your thinner deck (57 instead of 58 or 59) than if you mulligan 2 more times. @craw_advantage I know, I know. Maybe this is better in control/combo decks? @Protoaddct that's what I was thinking. This interacts poorly with fetches on the first turns, which is almost 100% guaranteed will happen. The card is actually much better in lists where there are a number of cards you do not want to draw as opposed to a list that finds you ones you want early. It lets you tuck away Blightsteel, Timevault/Key, High cost Delve stuff that you can see from your opener that you will not be playing for some time, Leylines that are worthless to you unless they are in your opener, arguably every other card that has a pregame effect that you do not want to draw like Chancelors and more serum powders, and cards that interact poorly with themselves but that you run in multiple regardless because you need one of the effects early on. 4/4 flyer with upside for four mana (meh). I don't know where this will end up being best, but personally I find it most appealing in a deck that can make use of all three of those. A Uxx midrange deck will still love the opening hand sculpting when it happens, will not mind pitching it to Force and potentially Dack/JVP, and might even not hate just playing it as a late game beater from time to time. As you say though, there's a tension between this and fetchlands... I wonder if it's worthwhile to try cutting fetches and maybe running some other scry stuff? In addition to greater determinism in mulliganing, Powder puts the Bazaar in your hand, not just on the top of your deck. Now I could see this maybe being played alongside of Powder, or in something like a survival list because it boosts the blue count and helps your opening hands. @craw_advantage I really don't think you need to hit number 3 outside of corner cases to make this valuable. In ANY match where you get into a top deck war, a 4/4 flyer that also scrys for 1 every turn is a perfectly fine clock and the other value he provides more than makes up for any short coming he may have versus other options. Like yes drawing JTMS in a topdeck war is better, but you can only run so many of them and he does not provide the other utility. Most people do not evaluate Simian spirit guide based on how good it is when you hard cast it, and I feel like it is a fair comparison since using this card specifically for its pregame and its card color is perfectly reasonable. As for cutting fetches and adding more scry, I don't think that is viable. You lose Jace, you lose brainstorm, and likely you lose consistent mana at the level you need. The Sphinx seems extremely powerful when you're on the draw: you get the best of your top three cards immediately on your first turn, even if you've pitched Sphinx to Force of Will in the meantime; the fact that the Sphinx can be cast later in the game for value is a bonus. On the play I'm less excited---one way to approach Sphinx is to ask yourself: if you could start the game with a blind mulligan, but you got to scry three cards instead of one, would you do so? 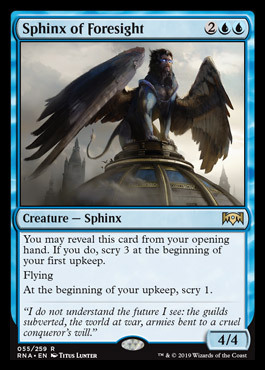 Sphinx is slightly better since at some later point you may be able to pitch or cast him, but the opportunity cost of starting down a card that's more immediately playable strikes me as rather high. I think the best way to evaluate this guy is to start with decks that would not have to rejigger their entire manabase and structure to make him work. What that does leave is the fore mentioned dredge and Blue combo/control lists that do not rely solely on shuffles and fetches (stuff that runs vault key and tezz most likely), and maybe some cornercase tier 2.5/3 decks. Honestly, my brain tells me right now hes just a dredge thing, but a very good dredge thing. I would not be suprised for someone to come up with some really over the top broken use case for him in a blue deck that runs a lot of situational cards though. Like I said, hes better in a list that has a bunch of cards it does not want to draw rather than put on the top, so really the type of scrys you want to see with this guy are him just putting 2 or 3 cards on the bottom to dig you closer to a specific piece you need to assemble Voltron or whatever. This doesn't seem that good in pitch dredge? You still get almost-guaranteed Bazaar turn 1 but does the deck need more blue cards? Like yes drawing JTMS in a topdeck war is better, but you can only run so many of them and he does not provide the other utility. One thing to consider when you say you can play this alongside Jace is not just the planeswalker rule aspect, but how many 4 drops you're planning on playing. I think people are really underestimating this card once you are passed keep/mull decisions. Its a 4/4 for 4 with evasion. Considering fetches, probes, ancient tombs etc this is a 3-4 turn clock with evasion that fixes card draws and it potentially comes down on turn 1 or 2 (most likely by 3). I think any deck that plays bazaar want's this guy. I don't run matlab buy I think at a certain point in muligans (somwhere around 5) revealing this is better than going further as far as finding a bazaar and having a keepable hand. Survival wan't this because its a blue card thats a dude and is good. This card was created to support the best of one matches in Arena. I am on the fence on if this could be remotely playable in Vintage. If you run Sensei's Top or Preordain you gain more advantage because of the continued use of top or just having a cantrip and adding a card to the graveyard. I was thinking about a blue control deck or maybe StandStill but the upside of the card is just not good enough in a format with Pyroblast and Swords to Plowshares. I want to like this card and I would play it in a Modern Blue Moon deck. Both of these cards cost mana, can be countered by most counterspells, cannot be used to kill your opponent, and do not happen in the set up phase of the game. I find that this is scarcely an apt comparison. I think this card is strong enough that it could spawn new deck types and change existing ones pretty drastically. This card plays really nicely with Street Wraith which is fringe playable in dredge and it actually makes me wonder if a leyline of anticipation deck could not come back where you can use this to set up as well as get rid of dead leylines. My prediction so far is that we see this in a pitch dredge list that trys to go off turn one more consistently in game one. Probe, Street wraith, free counters, using the extra 3 cards you see and potentially bury to set up bigger potential turn one dread returns.